1.Download the Excel template file here. 2. Open the Excel file. 4. Log into SooPOS and then access the Vendors menu. Step 1: Ensure that the fields on the left match the fields on the right identically. Step 2: Select OK to proceed with the import. 9. A prompt will appear notifying you of a successful import. 10. If you want to roll back the changes made, access the Vendors menu again and after selecting the Import Vendors option, from the drop down menu select Roll Back Last Vendors Import. 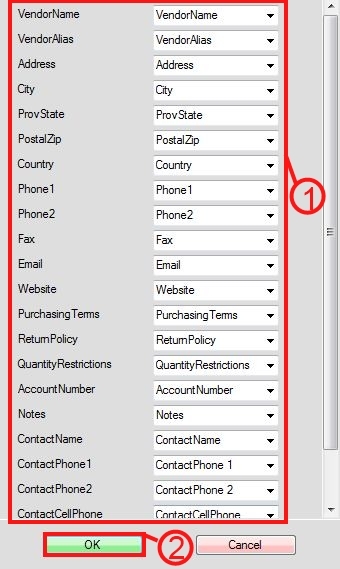 Note: To import to update existing customers you must match the vendor name and alias values.